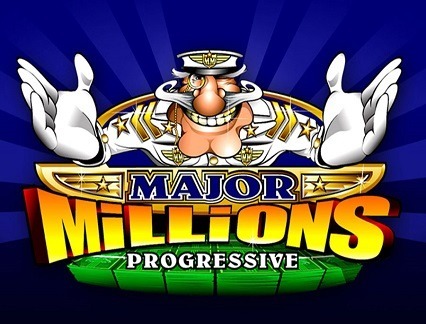 Game Information: Major Millions is one of Microgaming’s oldest known progressive pokie. 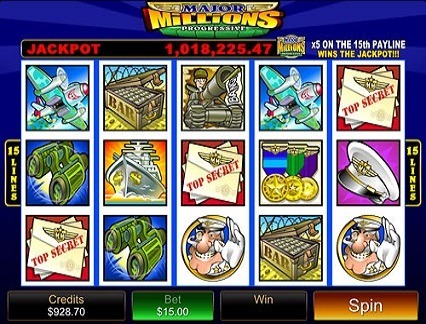 This progressive pokie features a cartoon-like military theme and offers 5 reels and 15 pay lines that are filled with all sorts of military-related symbols and themes including tanks, bomber planes, warships and all sorts of other military and war themes. Even though Major Millions is an old progressive pokie game, it is still one of the most played progressives at Microgaming online casinos, ensuring that the progressive jackpot total is always high, or, if it’s been won, will rise very quickly again. The game is also available in an easier 3 reel and 3 pay line version. The wild symbol in Major Millions is the Major Millions Logo. The wild symbol will substitute other game symbols with the exception of the Scatter symbol to complete easy winning combinations. 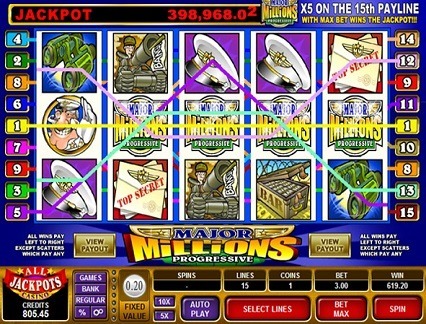 The Major Millions Logo wild symbol will also add a 3x multiplier to winning combinations that it is a part of. The Scatter symbol in Major Millions is the Exploding symbol and getting three or more anywhere across the 5 reels will increase your win total with a 3x, 5x, or 50x total multiplier. The strength of your multiplier will depend on how many exploding scatter symbols you land, with a maximum of five per spin possible. The graphics on Major Millions are more cartoon-like, similar in some ways to its cousin, King Cashalot. The idea behind the graphics is to keep everything fun and light-hearted, even though the overall theme is a war theme. The game features old-fashioned carnival music which accompanies the equally old-fashioned lights ad bells and whistles whenever a winning combination or jackpot is scored. Other sound effects including the Major himself laughing when you win and the sound of a marching band playing a happy march. The minimum jackpot amount that can be won in Major Millions is a cool $250,000 in theory although this will ultimately depend on how recently the jackpot was last hit. While the game is rated as a high volatility game, the pay-out rate may be somewhat more frequent than some of Microgaming’s other progressive jackpot games, an average of once every three months. Unlike some other progressive jackpot games, Major Millions is also very simple and there is no need for a special round or additional screens in order to land the big jackpot. All that players have to do in order to qualify for the major jackpot is to bet maximum bet, maximum paylines and land 5 Major Millions symbols across the fifteenth payline. Major Millions offers a few basic special features which nevertheless can add a great deal to your winning totals. Besides the major jackpot which requires 5 Major Millions logos across the 15th payline, the game also offers a cool scatter symbol which can add significant multipliers to your total. Depending on how many exploding scatters you get, you can add up to x50 multipliers to your total! The game is also available in a simple 3 reel and 3 payline version and can be played in Microgaming’s Expert Mode, Quick Spin, and Regular mode and also on AutoPlay.